Ready to take on the challenge of a chameleon? Here are two that would be a good choice for beginners. Are chameleons really that difficult? What is the easiest beginner chameleon? These are questions that we are frequently asked at reptile shows. While they admittedly require more care than a snake that eats once a week and doesn’t require lighting, chameleons are not entirely deserving of the difficult reputation they have long held, either. As for the latter question, a number of chameleon species incubated, hatched and raised to an appropriate size have proven to be very hardy captives when given appropriate conditions. Due to their availability and popularity, this article will focus on the veiled chameleon (Chamaeleo calyptratus) and the panther chameleon (Furcifer pardalis). As a teenager in the early 1990s, I worked at a pet store in Southern California with a large reptile selection. When the first pair of chameleons (wild-caught, adult Johnston’s chameleons) was brought into the store for sale, the manager was very discouraging and said, “Don’t ever buy a chameleon. It’ll be dead in 3 months.” The pair of Johnston’s chameleons sold after a week or so, only to have the customer return two days later seeking a refund for a deceased female. The male apparently didn’t last much longer. What a challenge! Through the local herp society and friends at work, I contacted a few people who were already having success with chameleons, and they served as encouragement and as resources for information. At the time, there were not any commercial chameleon breeders and sources for animals that were not wild-collected were limited at best. After some time, the decision was made to start keeping chameleons with a pair of Jackson’s (Trioceros jacksonii xantholophus). Despite the pet store manager’s warning, the young adult chameleons thrived but they never reproduced. My disappointment didn’t last long. At the time, five or six regional color morphs (also known as locales) of panther chameleons were recognized and often available as imports. Their incredible colors and the “collectability” of having a number of different forms proved irresistible. In 1992, I acquired a pair of Nosy Be panther chameleons and babies soon followed. Just as I had read and heard from others, the neonates proved to be virtually problem free during raising, and of those adults that we kept, they retained good health. Chameleons’ reputation for being difficult, especially for beginning reptilekeepers, obviously goes back even further than the 1990s. It is my opinion that it has been due, in large part, to the poor experiences with wild-caught specimens. In the wild, many of the more commonly seen species in the pet trade are exposed to frequent rains and are able to eat daily, which helps cater to a high-activity, fast-metabolism life. The rigors of capture, eventual transport to an exporter’s facility, the wait for the international order to be sold and shipped, another temporary stay in the importer’s cages until being sold to the pet store, where the final owner purchases them, are well-documented and have deleterious effects on the long-term health of chameleons. Before any potential new keeper decides to try chameleons, it is important to note that there will be a significant difference between the chances of success when starting with captive-bred/hatched babies versus adult imports. Prepared owners, who set up their chameleons appropriately from the very beginning and provide consistent care, will not find chameleons hatched and raised in captivity to be that challenging, but they will find them to be plenty rewarding. The relatively large, colorful veiled chameleon (Chamaeleo calyptratus) is found on the Arabian Peninsula in the countries Yemen and Saudi Arabia. It is frequently found at elevations above 4,000 feet in Yemen, where rainfall can reach more than 70 inches per year. Although the climate is often arid, rainfall can be heavy at times, and the chameleons will take advantage, drinking their fill before the moisture quickly evaporates. They also experience extreme temperatures in both directions, with lows hovering around freezing overnight during the winter and days that frequently rise above 110 degrees Fahrenheit. The veiled chameleon’s hardiness in captivity is likely due to its ability to survive in such a harsh climate compared to other chameleon species. While virtually all of the available animals in the pet industry are bred and raised in captivity, veiled chameleons occasionally pop up for sale that are sourced from wild populations in Yemen and, more commonly, introduced populations in South Florida. Due to the possibility of exposure to parasites, as well as the rigors of capture and transport in the case of chameleons from Yemen, these specimens are best avoided by beginning chameleon keepers in favor of hatchling chameleons raised in captivity. Adult male veiled chameleons have been known to reach lengths of 22 inches however most average around 18 inches with females being a few inches shorter. Veiled chameleons are more tolerant of both high and low temperatures than panther chameleons, but in captivity, their care is quite similar. The panther chameleon (Furcifer pardalis) is another large chameleon species. Although introduced by man onto Reunion Island in the Indian Ocean, it is endemic to coastal areas in Madagascar and ranges from near the city of Toamasina (Tamatave) on the east coast up to the northernmost tip of the island and then back down the northwestern coast to the Ampasindava Peninsula and Ankaramibe (Ankaramy). Adult males frequently reach 16 to 18 inches in total length, with the rare individual up to 22 inches. Females are smaller at 12 to 14 inches. There are not any recognized subspecies of F. pardalis, which may be confusing at first when they are associated with additional names, such as Ambilobe, Nosy Be, Sambava, etc. These additional names are locations in Madagascar, often major towns or islands, where populations of distinct color forms of the species can be found. In captivity, breeders strive to reproduce chameleons that resemble the original wild populations in color and pattern. Hybrid offspring from parents of multiple locales are also produced by some breeders and often result in striking color combinations. Due to the variability between color morphs, the panther chameleon is the most “collectable” chameleon, with many keepers housing individuals of several locales at once. It is beyond the scope of this article to describe the color combinations possible in panther chameleons, but there are several hobbyist and breeder websites with photos of adult males encountered in the wild and/or wild-caught breeding stock for further reference. Although they can be flighty as juveniles, many adults that are occasionally interacted with seem to lose much of their instinctual fear toward our activities and may be handled easily. When choosing where to purchase that chameleon it is important to remember that starting off with a healthy animal is one of the most important keys to success. A healthy baby should be alert and active when the lights are on and they do not “nap.” They should be strong enough to go running away from a hand in the cage. Well-fed and hydrated chameleons will not have any areas that appear sunken-in along the sides or top of the head, limbs or side of the tail. Watch the chameleon for a couple of minutes for any quick extensions of the gular area (throat) that may be accompanied by a soft gasp, often indicative of respiratory infection. Inquire about the size of crickets that are currently being consumed. We consider babies of either species that are large enough to eat one-fourth-inch (two-week-old) crickets to be established and ready for permanent homes. Although there is some variation in the size of hatchlings between clutches, babies are generally eating one-fourth-inch crickets between eight to 10 weeks of age. If selecting your new pet in person is not a possibility, there are several commercial breeders with websites where animals may be purchased from specific bloodlines. These animals are then packed according to predicted weather and shipped via an overnight carrier for arrival at their new home the following morning. As chameleons cannot see in the dark anyway, the shipment often results in just a few added hours of sleep on an unusually “windy” night and they arrive none the worse for wear. There are a few basics that the cage must include, but how elaborate the overall setup becomes is up to the keeper. For a chameleon to thrive in captivity, its environment should simulate natural conditions as closely as possible. These are arboreal lizards that live in a three-dimensional environment, love the sun, are never exposed to stagnant air and are hunters/opportunistic feeders. On Madagascar, most of the regions where panther chameleons are found experience frequent rainfall and this should be taken into consideration when designing the cage. For these species of chameleons, we only use vertically oriented screen cages. As long as food is easy to find, the bigger the enclosure, the better. Elevating the cage and placing it where other household pets are unable to closely watch the inhabitant is essential when it comes to giving the chameleon a sense of security. The use of dead tree branches for climbing and perching areas, in combination with live plants, such as Schefflera arboricola, Ficus benjamina and Pothos sp., can make very attractive displays, with a colorful veiled or panther as the highlight. Schefflera is my plant of choice because it holds up well under frequent waterings and is resilient to being trampled by lizards. Stick to plants that are nontoxic and have no irritating qualities, as some chameleons or even feeder insects may occasionally ingest them. It is also a good idea to wash recently acquired plants to make sure they are pesticide-free. Cages that make use of the bendable vines and plastic plant foliage produced by several manufacturers in the reptile supply industry can be attractive and are also easily cleaned. Several horizontal branches for resting areas should be provided, as well as foliage that is dense enough to offer refuge areas where they can feel hidden from view. These two species of chameleons love to bask in the sun and they are the masters at regulating their own body temperatures. They are best kept at room temperatures in the 70’s and should be provided with an incandescent light of 60 watts installed in a lightweight fixture that can be placed on the top screen of the cage. A branch placed below the basking bulb should be close enough to allow the chameleon to enjoy temperatures in the low- to mid-90 degrees, without being close enough to risk burns. Like most other sun-loving reptiles, a fluorescent UVB bulb should also be used daily so that the animals can synthesize vitamin D3, which is essential for proper calcium absorption. If the enclosure seems too dim, an additional fluorescent bulb can be added with 6,500-Kelvin lamps being a good choice for brightness and plant growth. A day/night schedule with 13 hours of light works well for these tropical lizards. Most chameleons will not drink standing water. They lick water from the surfaces in their enclosures (leaves, screen, etc.) or drink from slow drips. For baby through juvenile sizes, misting the foliage in the enclosure two to three times per day is adequate. Once they are larger, more water should be made available. This can be as low-tech as poking a small hole in the bottom of a plastic cup so that water drips out slowly to automated misting systems. 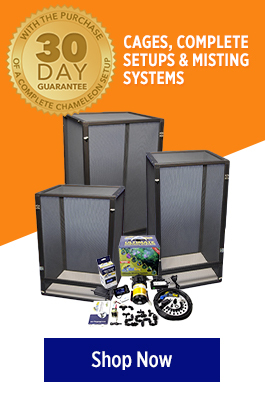 Panther chameleons, especially, will appreciate if the mist from these systems is directed at the top of the cage so that the moisture collects in the screen first and then “rains” down as droplets are formed. Some chameleons can be easily trained to drink right from pipettes or the nozzles of hand-misting bottles, which offers the keeper an easy way to keep track of exactly how much water is being consumed. When it comes to feeding, baby chameleons should be allowed to eat as much as they can each day, without having more than a cricket or two left over when the lights go out at night. Although uncommon, hungry crickets have been known to pick at sleeping chameleons, so it is better to be safe than sorry if one suspects too many crickets have been left uneaten. In order to optimize nutrition for the growing chameleons, a supply of crickets should be purchased that can be gut-loaded with a healthy diet prior to being fed out. A variety of foods may be used, but an emphasis on dark leafy greens, high-pigment vegetables and commercial, grain-based insect diets work well. Because they grow so quickly, babies and juveniles need to have their food supplemented with calcium powder more frequently than adults. This can safely be done two to three feedings per week. Just place the crickets in a plastic bag, add a small amount of calcium powder, and use the old shake-n-bake method to coat the crickets before releasing them into the chameleon’s cage. Once adult size is reached the calcium requirements are lower (except in reproducing females) and we typically supplement only once or twice per week. We also use several of the reptile vitamin and mineral supplements, on rotation, once a week for babies and once or twice a month for adults. One of the most important lessons to impart on new chameleon owners is to take the time to monitor the chameleon frequently and to use some intuition when there is a sense that something is amiss. Many potential health problems can be avoided or quickly remedied when noticed and acted upon early. Chameleons are notorious for hiding illness until they just physically can’t anymore and by then it is often too late for successful treatment. One of the most obvious things to potentially notice is a loss of appetite. While a day or two without eating is uncommon for most captive bred chameleons, it is not overly detrimental. An extended period of refusal to eat, especially their favorite foods, usually means something is wrong and a veterinarian’s assistance should be sought. Respiratory distress is often manifest in gasping with the mouth open, soft popping noises while breathing, or the mouth/throat filled with foamy bubbles. For the best results a veterinarian should be consulted to prescribe the appropriate antibiotics. Like any reptile pet, things can go wrong with chameleons if they are not set up properly from the beginning. When given the appropriate conditions to thrive, panther and veiled chameleons often live up to 7 years, while providing a fascinating display of behaviors and bright colors. Kent Manchen is an archaeologist in Southern California currently completing his Master’s thesis at San Diego State University. He has been keeping reptiles for 30 years and has worked with 30 species of chameleons since 1991. Kent joined with friend Michael Monge in FL Chams (www.flchams.com) and currently works with a number of Panther Chameleon locales as well as a few of the more uncommon species. Deas, John. 2002. “In Search of the Veiled or Yemen Chameleon, Chameleo calyptratus.” Chameleon Information Network Journal, 43:10-20. Necas, Petr. 2004. 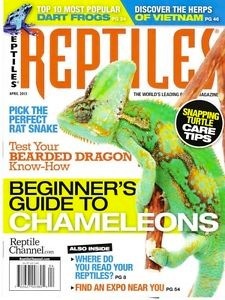 Chameleons: Nature’s Hidden Jewels, 2nd ed. Frankfurt: Edition Chimaira.